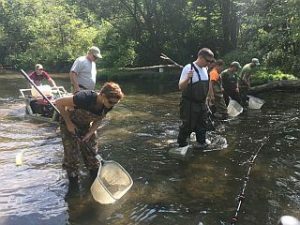 During the summer of 2017, the Illinois Department of Natural Resources conducted fish surveys in the Fox River basin as part of a statewide program to monitor the health of Illinois stream resources. This is the fifth survey conducted in the Fox basin since 1996, providing an opportunity to examine stream conditions over a 21-year period. 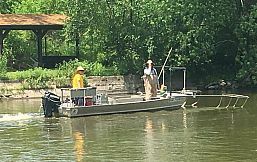 So far, we have sampled fish at 15 stations on the main stem of the Fox River, and 28 stations at tributary locations, and work is still in progress. The Illinois Environmental Protection Agency (IEPA) collaborates on these surveys by sampling water quality and macroinvertebrates, which together with the fish data provide a comprehensive look at the Fox River ecosystem. We collect fish primarily by electrofishing, a non-lethal technique which stuns the fish. We can then net them, place them in an oxygenated tub, identify, weigh, measure, and release them back into the water. On the main stem of the r iver, we use boat electrofishing (photo right), which entails sampling for 60 minutes at each station (30 minutes along each shoreline). We also conduct three seine hauls at each station in order to sample smaller fish that are not as vulnerable to electrofishing. At the wade-able tributary locations, we use a device known as an electric seine (photo left). The electric seine is 30 feet long with droppers every 18 inches delivering an electrical field across the width of the stream. Netters wade behind the seine and capture the stunned fish. The fish are placed in a tub, which along with the generator, is carried on a unique vehicle called the “Roller Beast” (photo right). 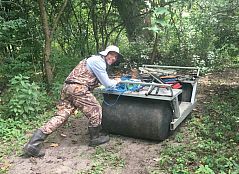 This “Fred Flintstone-like” design was borrowed from Ohio Department of Natural Resources, and thanks to two empty plastic lawn rollers, it can roll over land as well as float in pools and roll over riffles. This relatively new addition to our equipment line makes it much easier to access the streams without carrying all the gear – great for us senior biologists. It will be a while before we are able to compile all the data from 2017 surveys, but based on our field observations, conditions appear to be similar to previous surveys, with a few exceptions. We conducted the main stem survey in June. 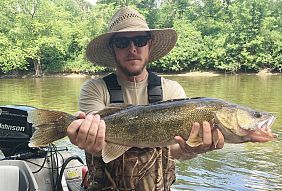 It produced good results for sport fishes throughout most of the river. Smallmouth bass (photo left) are relatively common at many of the free flowing locations between Algonquin and Ottawa. 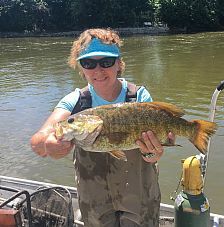 In fact, Algonquin once again took the prize for the most smallmouth bass. Channel catfish are also found at most locations and are locally abundant especially in the rocky, riffle areas. Flathead catfish (photo right) and walleye (photo left) are found in many of the deeper pools. Upstream of Algonquin there are largemouth bass, bluegill, and a few northern pike, species which prefer the slower moving, lake-like conditions in the upper river. Typically, we find the best overall fish species diversity in the downstream areas of the river where the number of dams and urban density decrease. In these areas the suckers (Catostomidae) rule, including one of our favorites, the pollution intolerant northern hogsucker. Collections from the tributaries showed a pattern similar to the main stem, with diversity and quality increasing in the downstream, less urbanized areas. However, several urbanized streams like Ferson Creek held sensitive species including mottled sculpin and several darter species while the area of Tyler Creek upstream of Randall Road also had mottled sculpin in addition to rainbow darter (right). 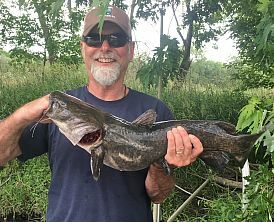 The mottled sculpin is a cool-water fish and occurs in only a few other areas of the state outside of the Fox River basin with its abundant seeps and fens. 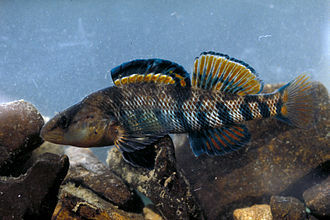 Moving downstream in the Fox Watershed, darter species became very abundant, including fantail darters (left), and of course, suckers also became more prevalent, including sensitive species like the black redhorse (right). Several sites sampled in 2017 improved compared to the 2012 survey when drought conditions prevailed. The sites hit the hardest by the 2012 drought were ones used for cattle grazing. Cattle and low water is a bad combination. The good news is that without any dams present, locations like Indian and Buck Creeks recovered in 2017 to pre-drought conditions thanks to direct connections to downstream recruitment sources. Speaking of deleted dams, we also observed continued improvement in Blackberry Creek this year, resulting from the 2013 removal of the River Road dam. We found at least two new species, flathead catfish and rosyface shiner, five miles upstream of the dam removal site! One of most unusual finds in 2017 was from Silver Creek in McHenry County, near Oakwood Hills. 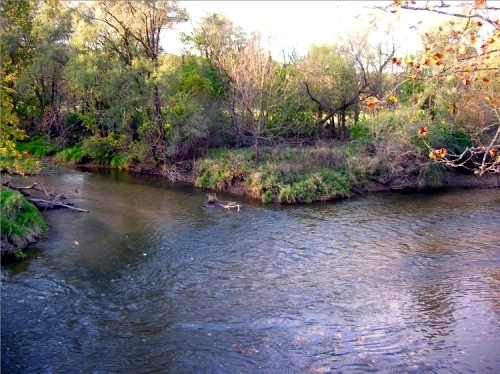 This stream runs through the Bates Fen Nature Preserve where the cool, clear water supports a population of American brook lamprey (left) which is very rare in Northeastern Illinois. 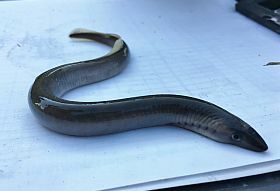 These larval lamprey, known as “ammocoetes”, were found in silt deposits where they feed on microorganisms as they mature into non-parasitic adults. Spawning occurs in aggregations, typically around rocky areas with some current. We do not know where they spawn in Silver Creek, which has a substrate largely composed of sand and peat. Another surprise in Silver Creek, due to its cool temperature, was finding the mottled sculpin, which is also typically associated with rocky streams. After completing the remaining surveys in the fall, we will spend the winter sorting through samples and compiling our results, which will provide the 2017 snapshot of conditions in the Fox River watershed. Fish are a very useful measure of stream quality since they occupy all types of habitats, and utilize a wide range of aquatic food resources. The “Index of Biotic Integrity” (IBI) integrates many of these ecological factors into one single score for each sampling location. The IBI ranges from 0 to 60 and provides a useful indicator for examination of spatial and temporal trends in stream quality. The IBI results were variable across Fox basin streams in 2012. Our previous survey had scores on the main stem ranging from 29 (Rt. 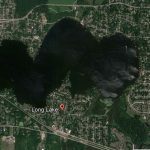 173) to 56 (downstream of Yorkville) and from 13 (Flint Creek) to 57 (Big Rock Creek) on the tributaries. With a few exceptions, IBI scores generally increased as urban land cover decreased, a familiar trend across Illinois and throughout the U. S.
From a regional standpoint, the overall quality on the Fox River main stem is lower than the mostly agricultural Kankakee River, but higher than the highly urbanized Des Plaines River. 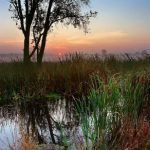 However, tributaries in the lower Fox River watershed are among the best in the State. For us fish nerds, it is always exciting to plug in the numbers and see the results from the summer sampling. We all recognize that the quality of life is closely tied to the quality of our environment. This is especially true for streams, which by their nature integrate all that is happening on the landscape. 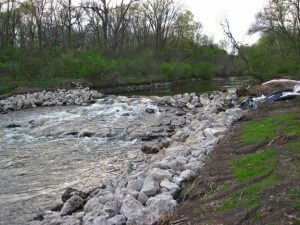 Groups like the Friends of the Fox River are vital in the effort to protect and improve this valuable resource. Information from the basin surveys is useful to the Friends of the Fox and others for planning and tracking projects, reviewing impacts, and perhaps most importantly, educating the public. 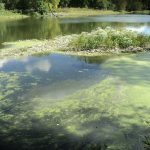 We look forward to working with Friends of the Fox River in pursuing our common mission: clean and sustainable streams in the Fox basin. (Authors note: This work is funded in large part by the Sportfish Restoration Fund, a Federal Program which provides money to the states for fisheries research and management. The money originates from an excise tax on sporting goods and is returned to each state based on the number of fishing licenses sold). Well it’s good to know that it’s still in good condition and pursuing its common mission is a great way to keep it clean and sustainable.